We applaud you for wanting to go beyond by bettering yourself through graduate education. We pride ourselves on working collaboratively to prepare you to be successful. In short, we want to add value to your professional career. Does this sound like something you aspire to do too? 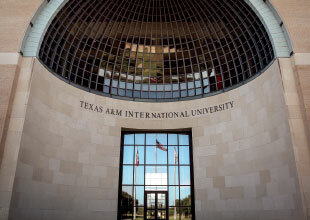 Texas A&M International University (TAMIU) is a member of The Texas A&M University System and prepares students for leadership roles in an increasingly complex, culturally diverse state, national, and global society. Through instruction, faculty and student research, andpublic service, TAMIU improves the quality of lives for citizens of the US–Mexico border region, the state of Texas, and national and international communities. The Graduate School acts as the intellectual and academic heart of theUniversity as we strive to train and educate the next generation of researchers, scholars, teachers, business professionals, and nurses. Faculty members will offer you courses leading to one of 25 graduate degrees in Humanities; Business; Education; Health; Mathematics, Biological, and Social Sciences; and a doctoral degree in International Business. We are one of a few institutions to offer a PhD in International Business and have dedicated much time and effort to the success of the program. TAMIU also offers a collaborative doctoral program in Hispanic Studies. TAMIU has been a pioneer in teacher and educator preparation, empowering talented individuals who desire to inspire and lead real change; who are challenged and develop deep and meaningful specializations to drive careers of distinction and purpose. Learner-centered faculty lead online programs and certifications that are accessible, affordable, convenient, flexible, and of high academic standards. Our programs and certifications are infused with an international perspective. Courses are delivered by well-qualified, experienced international faculty who promote learning for diverse educational environments. TAMIU ranked fourth among the “Top 100 Best Bang for the Buck” rankings of Southern Universities by Washington Monthly magazine. Money magazine has ranked TAMIU fifth for Best Value Tuition and graded it “A” for Value Added. Bilingual Education has proven to be among the most in-demand and well-compensated critical shortageeducational specialties. Our flexible online 36-hour degree program prepares graduates for leadership rolesthat promote bilingual education implementation, impacting learners from diverse linguistic backgrounds.Graduates can pursue careers as adjunct professors, curriculum specialists, bilingual education specialists,educational consultants, and educational materials designers. Our Master of Science in Curriculum and Instruction ranked #10 in the nation for quality and affordability according to AffordableColleges.com. This 36-hour online degree enables graduates to assume a curricular leadership role with the implementation and evaluation of effective models of teaching and learning to impact diverse learners and close achievement gaps. Specializations include Bilingual Education, Reading, or EducationalAdministration. The latter is our most popular and perfect for aspiring school administrators. Graduates can assume leadership positions as teacher-leaders, curriculum designers or specialists, curriculum and instruction coordinators, staff development specialists, or educational consultants. Our MPA program is one of two NASPAA-accredited programs in the A&M System. We have a low student-faculty ratio that enhances advisement and mentorship. Our program is flexible enough to accommodate your work schedule and it makes you professionally competent while qualifying you for different careers in public and nonprofit agencies. You will gain real work experience through our internship and project courses, which offer opportunities for you to engage with public and nonprofit agencies. You have the choice to select from a variety of elective courses to build your professional competence and enhance your intellectual interests. Our degree is an ideal major that is uniquely suited for careers in government and nonprofit leadership and management. Our MSCJ program trains the next generation of practitioners who can perform research in specialized areasthat are critical to border and homeland security, as well as become critical consumers of science in an ever-increasing science-based workforce. Our faculty’s research expertise, which is supported through numerous national and international grant funding, helps ensure that students are provided with current and provenstrategies to immediately respond to these regional, state, and national crime and justice concerns. Our Master of Business Administration (MBA) program, offered in both English and Spanish, is designed to honestudents’ skills from financial and strategic analysis to creating in-depth marketing plans. It examines current financial, strategic, and managerial situations. Graduates will secure a knowledge base that enables them toevaluate and resolve a vast array of today’s pressing business problems. Accredited by AACSB International, we provide high-quality professional and internationalized education to undergraduate, master’s-level, anddoctoral students. Our primary objectives focus on education for the administration of business organizations. Nationally recognized by The Princeton Review in 2013, the A.R. Sanchez, Jr. School of Business was ranked third in the nation for “Greatest Opportunity for Minority Students” and named to the “Best Business Schools West” listing among the nation’s 295 most outstanding business schools. The mission of the Dr. F.M. Canseco School of Nursing is to prepare professional nurses to improve the well-being of complex and diverse populations. Our curriculum is aimed at educating advanced practice nurseleaders who, through research, policy, and practice, promote the health and well-being of local, national, and international communities so that all people can thrive. In doing so, it underscores its geographic and institutional strengths to prepare nursing prospects. The curriculum includes course work required by the Texas Board of Nursing (TBON) and professional accrediting organizations. This course work is competency based for both the FNP andNADM programs. Core competencies utilized for the FNP program have been developed by the National Organization of Nurse Practitioner Faculties (NONPF). Competencies for the NADM program have been developed by the American Organization of Nurse Executives (AONE). Both organizations, NONPF and AONE, provide certification examinations for practice in the chosen role. Information about graduate admission and deadlines is located at tamiu.edu/gradschool. Graduate applications are available at applytexas.org. The $35 application fee may be paid online at tamiu.edu/gradschool. More in-depth information for each program is available online at tamiu.edu/catalog/current. Graduate financial support and scholarships are available for those who qualify. More information is available at tamiu.edu/gradschool.